Luckily for Alexa (and for us diners! 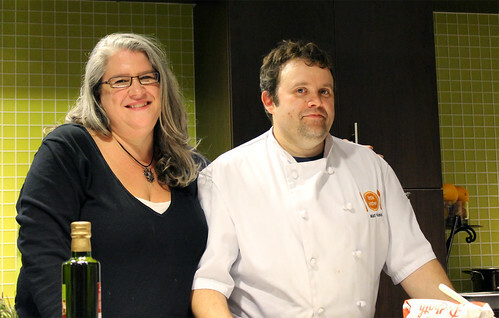 ), she got Chef Matt Kantor to agree to cook in the kitchen. If the name sounds familiar, then you probably heard his name being associated with the popular Toronto underground Secret Pickle Supper Club (which he co-founded with Alexa), and more recently, the El Bulli Imitació dinner series he did at The Cookbook Store a few weeks ago. 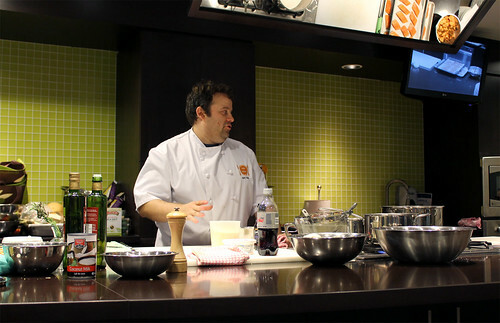 The challenge for Chef Kantor was to come up with a menu with each course featuring an Ontario grown or produced ingredient, and all the ingredients he was going to use for the meal had to be purchased from Longo’s. With this in mind, Chef Kantor and Alexa created a menu that was local-minded but would take our taste buds all around the world, spanning five different countries (well, six if you count the additional cheese course they added). It certainly wasn’t easy—getting a variety of fresh, local produce at this time of the year is hard to come by. But Chef Kantor made the best of things and came up with a stellar menu. 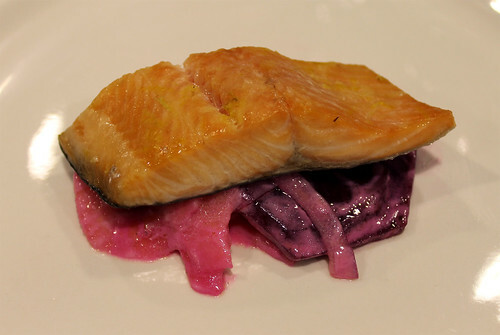 First course (Sweden) – Lightly cured trout with pickled beet and apple salad. The fish was cured with salt, sugar and sugar, and was flashed under some heat to finish. Feature Taste Ontario ingredients: trout, beets, and honeycrisp apples. Paired with Stratus Tolgate White 2007. Second course (Thailand) – Thai red curry squash. A superbly flavourful curry broth featuring chillies, ginger, lemongrass and fish sauce. The butternut squash was cooked in coconut milk until just cooked through. 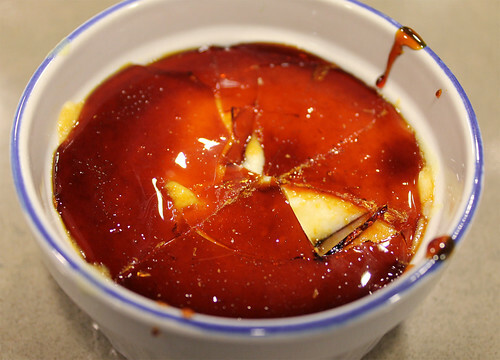 So comforting and warm, with the perfect amount of heat to leave a little kick in the back of your throat long after you’ve had your last bite of the dish. Feature Taste Ontario ingredient: butternut squash. Paired with Duggan’s #9 IPA. 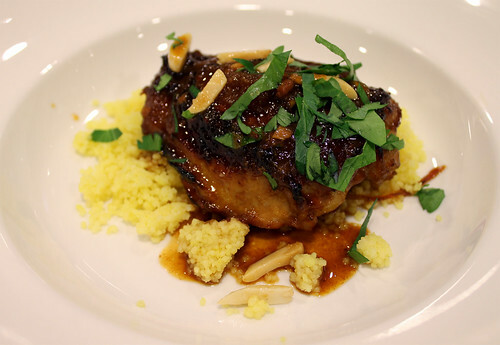 Third course (Moroccan) – Chicken tagine with couscous. This was by far my favourite dish of the evening. I’m a big fan of savoury/sweet dishes, and love the flavours in Moroccan dishes. Chef Kantor’s version was delicious without being too overpowering on the spices (it’s all about the balance). The chicken was incredibly tender, and the slivered almonds adds some textural element to the dish. Feature Taste Ontario ingredient: chicken. Paired with Tawse Grower’s Blend Pinot Noir 2008. 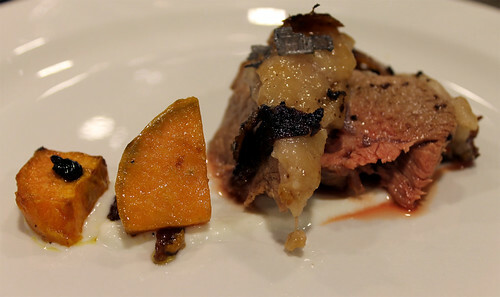 Fourth course (Iran) – Run-e bareh (spiced roast lamb). The lamb was rubbed with an Iranian-inspired spice rub before being roasted. It was served with sheep’s milk yogurt and roasted sweet potatoes. 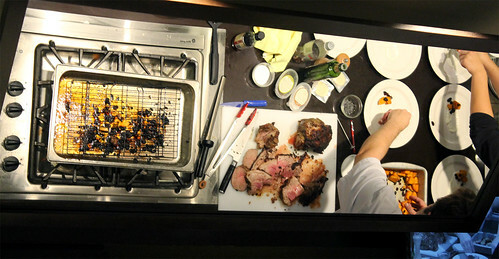 Feature Taste Ontario ingredient: lamb. Paired with Tawse Grower’s Blend Pinot Noir 2008. 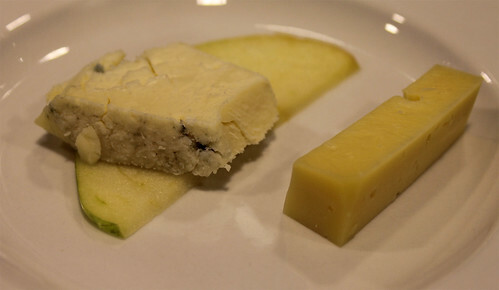 Fifth course (Ontario) – The all-Ontario course featured two beautiful cheeses: Devil’s Rock, served with a slice of honeycrisp apple, and Niagara Gold. Paired with Cave Spring’s Indian Summer Late Harvest Riesling 2009. 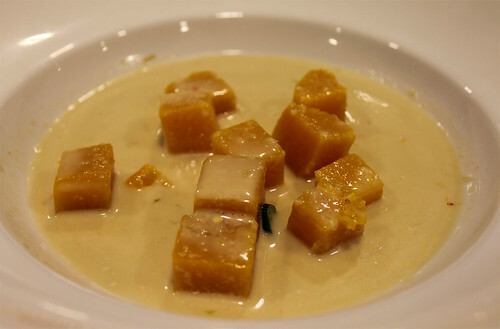 Sixth course (Spain) – Crème catalana, a Spanish version of a crème caramel flavoured with cinnamon and lemon zest. Feature Taste Ontario ingredients: eggs and milk. Paired with Cave Spring’s Indian Summer Late Harvest Riesling 2009. It was my first time at the Longo’s Maple Leaf Squares, although I have heard many others tell me about it. It’s fabulous to see that it is making a conscience effort to include as much Ontario grown and produced products in stores as more and more consumers become more aware of the importance of eating local. What was also impressive was Chef Kantor and Alexa’s ability to pick up all the ingredients they used for the meal in the store, which goes to show how well-stocked the Longo’s store is, not only with regular pantry staples, but ethnic ingredients as well. It makes for easy and convenient one-stop shopping when you just don’t have the time to hop and skip from shop to shop. 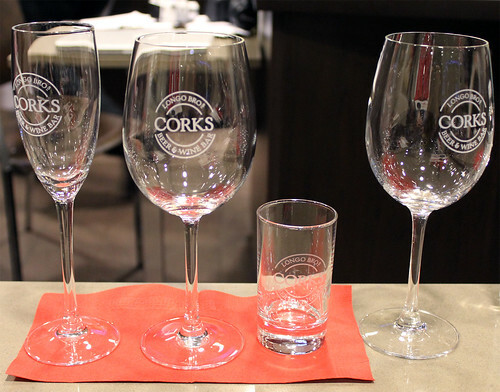 It’s also interesting to note that all the wines and beer that were served through the night were courtesy of Longo’s Brothers Corks Beer and Wine Bar, located right beside the Loft Kitchen and features all Ontario wines and craft beers. Amazing! A big thank you to Alexa for the invitet and for hosting a wonderful event. Thank you to Chef Kantor, who I’ve heard so much about for so long and have been following him on Twitter for a long time but have never ate his food before this evening. It was good, honest, delicious food that lets the ingredients take centre stage. I hope this is only the first of many more meals I’ll have cooked by Chef Kantor. And thank you to Longo’s, for providing the space and ingredients, and to the two staff who helped out throughout the evening. You can read more about the Taste Ontario Ambassador Program and the deliciously local adventures Alexa and Joel (aka @foodie411), the other Longo’s Taste Ontario Ambassador), get up to on the Longo’s blog. You can also view the full photo set from the event on Flickr.